The Central Indiana Railway, the last railroad to be constructed in Madison County, began life on July 3, 1871 as the Anderson, Lebanon & St. Louis Railroad with a meeting of seven men in Lebanon, Indiana. It's first President was Colonel Thomas N. Stilwell. Votes were held in Anderson and Stony Creek Townships on a tax levy to aid in the construction of the railroad. The tax levy passed and stock was sold in an effort to raise funds. Construction was begun on April 17, 1873 with the first shovelful of earth being turned by President Stilwell, but work was slowed due to the refusal of many taxpayers to pay the tax levy and with the absence of other funds, it wasn't until December 11, 1875, that the first spike was driven at Anderson at 2:30 p.m. by President Zion, the successor to President Stilwell. During the surveying of the line, the town of Lapel was laid out on April 27, 1876 by David Conrad and Samuel E. Busby. There was a link between the railroad and the town of Lapel as the following quote from Chapter 3 in Elmer G. Sulzer's "Ghost Railroads of Indiana" clearly demonstrates. a man's coat lapel. Hence the origin of the town of the same name." Despite the progress, it was still to be nearly two years before the road was completed to Noblesville, Indiana. On Thursday, June 14, 1877 an excursion train was run from Anderson to Noblesville, but by that time the road was in receivership and was changing hands for the first of what was to be many times. 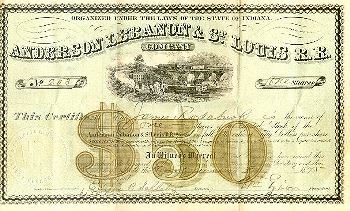 The AL&StL was sold on April 10, 1877 at Indianapolis at a foreclosure sale by the United States Marshall. It was purchased by Thomas Platt, president of the American Express Company, for $40,000. 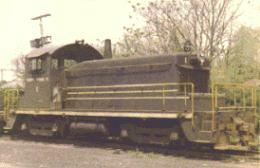 At the time of the sale, the AL&StL owned two locomotives. They had been attached by the sheriff of Madison County and both were chained to the track to satisfy a judgement. It was four years later on December 23rd of 1881 that the name was changed to the Cleveland, Indiana & St. Louis Railroad with operational control of the line passing to Harry Crawford of Chicago on April 1, 1885. The road was again reorganized into the Midland Railway Company on July 7, 1885. With the infusion of new money, work began immediately to continue the road westward to Paris, Illinois where connections could be made to St. Louis and points west, but there was another pause in construction when the road reached Lebanon due to the lack of ready capital. 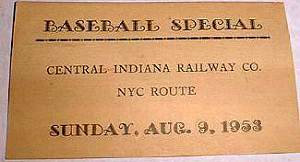 The track was completed to Waveland and from Waveland the Midland used the tracks of the Terre Haute & Logansport RR (later, part of the Vandalia) for the 22 miles to Sand Creek and from Sand Creek, the road was completed the final 12 miles westward to Brazil. The line never reached further west than this. On October 9, 1891 the Chicago & South Eastern was incorporated and by Deed Date of October 20, 1891 the Midland conveyed all property to the C&SE. Crawford once again agreed to complete the railroad. By the time the line was completed to the west in 1892 it was in trouble again. It had changed hands several times and had been beset with one financial difficulty after another. An attempt was made to extend the road to Muncie from Anderson. Right of Way had been secured and a large portion was graded, but work had been temporarily discontinued until 1896 for want of funds while the road was pushed west. The benefits to the localities in Madison County had fallen far short of expectations making it even more difficult to raise capital. Eventually, eastward construction was resumed and the C&SE expanded eastward until it reached Muncie, Indiana. In 1902 Crawford arranged for the sale of the line at a foreclosure sale to the Big Four (CCC&StL) and the Pan Handle (PCC&StL) who purchased the railroad jointly as a traffic bypass around Indianapolis. The C&SE was sold on Sept 1, 1902 and was once again renamed on March 16, 1903 to the Central Indiana Railway, the name that would last until 1986. At it's peak, it ran from Muncie, Indiana to Brazil, Indiana and with the failure of the Natural Gas fields around Anderson and Muncie, the CIRwy made money by hauling coal to the communities and the factories that had grown up during the Gas Boom. Stations on the line were Muncie, Avondale, Anderson, Lapel, Noblesville, Westfield, Jolietville, Roston, Gadsden, Lebanon, Advance, New Ross, Ladoga, Waveland, Waveland Junction, Sand Creek, E. Rockville, Bridgeton, Carbon and Brazil. The CIRwy ran a total distance of 117 miles and owned 11 locomotives and a variety of rolling stock. Substantial advances were made to the CI by its joint owners for rehabilitation before any real study was made of the use to which it might be put. When a study was made, it was determined that the CI was lightly constructed with much street running track. A substantial amount of upgrading would be necessary to operate heavy traffic over its trackage. The recommendation was that the property be junked. It wasn't until 1927 that the recommendations were partially followed. On September 14, 1928 the ICC granted permission to abandon trackage from Muncie to Anderson, Lebanon to Waveland Jct and Sand Creek to Brazil but the decision was challenged and the order was modified requiring the CI to retain the track between Lebanon-Max to Advance. It wasn't until October 18th 1943 that permission was granted to abandon the track between Lebanon and Advance leaving only the 43.95 miles from Anderson to Lebanon. Over the years the Central Indiana inherited a variety of motive power from its joint owners. They tended to be old, obsolete cast offs unneeded and unwanted by the Big Four (NYC) or the Pan Handle (PRR). 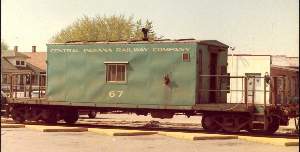 Although the locomotives may have been declared in excess by their owners, the lease/rental payments required of the CI were none-the-less substantial for such equipment. 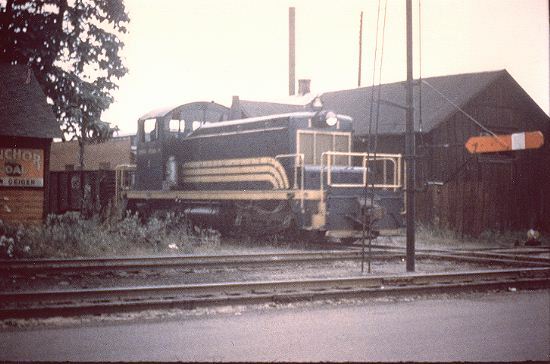 In the summer of 1949, the CIRwy took delivery of the first new locomotive that it ever owned, CI #1, an EMD SW1. On July 20, 1951 by agreement with the owners, Mr. Ike Duffey, owner of Emge Packing and of the Anderson Packers semi-pro basketball team, became president of the CI for a salary of $1 a year. (See From Time Business & Finance, They Like Ike) Duffey gave the railroad a degree of maintenance it had never known before. Ties and rail were replaced, cinder ballast added and individual shippers were personally contacted by Ike. Business increased with Duffey's active participation in virtually all aspects of the business from track worker and train crew to salesman and CEO. The CI made money serving various small shippers, from meat packers to grain dealers, warehouses and fertilizer plants to glass and tire manufacturers. In 1953, the Official Railway Equipment Register (ORER) listed the CI as making connections with the Monon (CIL) at Westfield, the Nickel Plate (NYC&StL) at Noblesville and with the NYC and PRR at both Anderson and Lebanon. The Maude Walker and the Duchess, Duffey's two private passenger cars became a familiar sight to many in the Anderson area being used for sports excursions and then being parked by the railroad's offices on Main Street about where 18th Street would have been. With Ike's death from Cancer in the late '60s, Paul Perdiue, Superintendent, became head of the CI with Bill Winchester as the General Freight Agent and the joint owners once began the slow starvation of the railroad. The Central Indiana's joint owners had undergone changes themselves. The Big Four, the CCC&StL, had come under the control of the New York Central (NYC) and the Pan Handle, the PCC&StL, became a part of the Pennsylvania Railroad (PRR). When the NYC and PRR merged on Feb. 1, 1968, ownership of the CI passed to the newly formed Penn Central RR (PC) and with their bankruptcy, it became a part of Conrail (CR) on April 1, 1976. By the mid 1980's it was in the process of being scrapped and it's last locomotive, CI 1, the EMD SW1 had been sold. The last remnant was sold on November 4, 1986 and became the Central Indiana & Western. CI 1 in original 'as delivered' paint eastbound at Noblesville just crossing the NKP in the early 50s. Ron Buser Collection. Burgess, George H. & Kennedy, Miles C.
Forkner, John L. & Dyson, Byron H.
Copyright 1997-2005 by Roger P. Hensley. Taken from the original work by Roger P. Hensley Copyright 1994.